No, I didn't pull a Kris Bryant super-vallyrian-X-factor-auto card. Sorry to disappoint, but that kind of luck doesn't find me when I open new release packs. That being said, I had a lot of fun opening up a blaster of 2015 Bowman. I know what you're thinking, "Dude, Ryan has LOST it. He is always raving about vintage and completely trolling modern cards. Now he gives us modern card pack-busting reviews in back-to-back days? WHAT IS LIFE?!?" Don't worry, I haven't lost my mind - or, at least not that I'm aware of. What I did do was embrace the "do what I want to do" potential of Father's Day a couple weekends ago and it was EVERYTHING I hoped it would be! 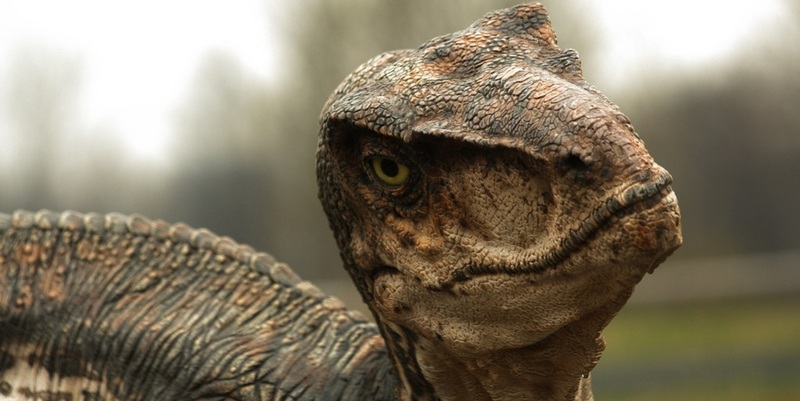 After getting our two older kids to bed, I kissed my wife on the forehead as she settled in with our newborn and whispered, "I'm off to see Jurassic World. I love you." You see, pillow talk has always been an area of expertise for me. Sorry ladies, I AM indeed madly in love with my wife - who, by the way, is totally cool for accepting me and all of my geek/collector-tastic tendencies. So, off I went, to go see a summer blockbuster movie by myself that I knew was going to be completely cheesy BUT DIDN'T CARE because I was going to see a movie. By myself. In a theater. My heart raced as I sped towards the targeted shopping center in my high-performance Camry. Carefully weighted down with two car seats in the back, I made a hairpin turn into the Target parking lot just prior to reaching the theater. "I'm buying some baseball cards, dammit." Gypsy Queen had tantalized me for several weeks so I snagged a couple of rack packs. But I wanted more...as luck would have it, I had been adjusting my fantasy baseball lineup earlier that day in the Buy-Buy-Baby parking lot. The minor league prospects from my roster were fresh in my mind, you see...so what happened next was purely an act of impulse. "Bowman! Bowman! I want SCHWARBER," was the weird rambling that escaped my mouth as I dashed towards the registers. Women & children warranted little regard as I weaved my way to an open register, glancing nervously at my watch to mark time until previews started. It's ALL about the previews, man. Nothing beats a Rizzo for my PC! Oooooh, sweet - Yankee prospects! I can lay claim to Luis Severino and Aaron Judge on my fantasy minor league rosters, but I'm glad the Yanks can claim this guy, Jorge Mateo. He is quickly gathering buzz in the Bombers' farm system as a speedster (52 bags as of 6/29) with offensive upside. Batting only .275 with a couple of homers, he is still growing at 20 years of age but has already matured greatly by displaying noteworthy plate discipline and working on his other tools as a ball player. These Chrome inserts are always nice and I'm ecstatic to add this Greg Bird to my collection. He is on the cusp of joining the Show as the parent club works out a future that is currently clouded with aging stars and rent-a-bats. Their time will eventually come to an end and Bird is a prime candidate to step in as a difference maker despite his season that was interrupted by a stint on the disabled list. Nelson Gomez was a multi-million dollar international signing for the Yanks. He holds a lot of potential offensive upside and is giving us a glimpse by batting .285 so far this season with five home runs in only 95 at-bats. That translates into some huge power potential, though I am a bit conflicted with his 3B designation alongside my Irish brother, Eric Jagielo. Good problem to have, I suppose. So there you go, some Bowman fun! I've only lightly dabbled in Bowman for the obvious reason that the set is all about the big prospect "hits" - autographs, colored parallels, etc. Par for the course, I didn't pull any mojo in my blaster. But as a fantasy baseball player who tracks minor league prospects across the league, this set has become a lot of fun for me to rip. I know a lot more of the players than I used to and that adds some meaning and enjoyment to an otherwise gamble-heavy release that my risk-averse collecting approach won't allow me to enjoy. Plus, I have half a mind to send all of these to my friend, The Lost Collector, so that he can get them autographed for me. He's a hobby badass like that. Thanks for reading and have a safe 4th of July! It dawned on me the other day that I was much more passionate about new release cards back in 2011. Inspired by the pending arrival of my son that July, I had just gotten back into our glorious hobby after nearly two decades of complete cardboard nothingness. Essentially, I collecting like a chicken with his head cut off those first few months back in the fray. I was buying a little of this and a little of that but buying some of everything that came out. Unfortunately, this didn't last long enough to include 2011 Topps Update (TROUT! ), but that's another discussion. To show for my economic contributions, I am very proud to have a complete, hand-collated "birth year" set of 2011 flagship and Archives for my son to flip through one day and enjoy (or trade for a video game, or sell for beer money, whatever path he takes). I am also darn near close to completing the Heritage and Gypsy Queen sets from that year - with one and twelve cards remaining, respectively. Check out my NEEDS list and see if we can help each other! Not too bad though, overall. But as you can divulge from my posts over the years since, my personal collecting habits have begun to steer away from modern releases. There's a myriad of reasons - some quite empirical while others are a bit more philosophical. It can be expensive to complete sets, pack by blaster by pack. Especially when you can just drop a little over $20 and bring entire Series home with no collating fuss and shipping included. The sellers usually even throw in a nice box. It's quite the inner conflict for this Collector, I assure you. Because I still like to open packs of baseball cards! There's still that rush to be had and, truth be told, there are still some pretty cool cards being made from a design perspective. The return on investment has become awfully risky, but there's no doubting the quality of photography and overall card construction for most sets...for the most part. And then I find myself in the card aisle at Target with a blaster of 2015 Gypsy Queen in my hand! Yep. I'm at it again - officially, I'm announcing that I will be pursuing the complete base set of 2015 GQ for my kid. I have a long way to go after only (6?) or so rack-packs, but I figure that I have some time. I'm not sure if I'll chase all of the SP's like I did in 2011. I can't afford to make the rookie mistake again of buying all GQ blasters in the state, as much as I'd like to...and that's okay. I think everyone will understand. The Shelby Miller represents what is probably my biggest "hit" of the rack packs, being a #'d /199 mini parallel. I'm a Braves fan, so this was a nice little bonus and the GQ mini's have slowly earned my appreciation over the years. I wish I could go back to 2011 when I amassed a considerable portion of a complete set of mini's. I didn't really understand what they were or how special it would have been to gather the whole run, so I ended up trading many away. That's okay - all part of the process. Moving on from the smaller cards, here is a regular-sized insert card of Robbie Cano entitled, "Pillars of the Community". What a great concept for a baseball card! We're often inundated with only the very worst news and stories regarding our diamond heroes but Topps has decided to swim upstream and provide an encouraging look at some charitable efforts being made by ball players in their teams' communities. Concept aside, this is a beautiful card. The image of Seattle is really sharp and means a little bit more to me as a former resident. I wonder if there was a discussion about working SAFECO Field into the background? In the end, I believe the Space Needle works better as the most iconic landmark for the Emerald City. At least they didn't go with the original Starbucks, am I right? Here's the back - are the GQ card-back write-ups getting shorter? I know they were always succinct by design, but this one seems fairly random (which I do appreciate) and sparse at only four lines with additional blank space to be had towards the bottom. Thoughts? Okay, so I have some work ahead of me to get my 2015 GQ NEEDS List posted, but hopefully I can stay the course and make a best effort to pull together some nice birth year sets for my youngest boy. Feel free to drop me a note if you think we can work out a swap. Long live set-building! Part of my collecting goals moving forward was to re-energize my pursuit of Don Mattingly cards for my favorite player collection. To break the seal on this new adventure, I snatched up a Donnie Baseball "lot" on the Bay of E for a decent price. It was a lot of fun to crack open and flip through - sometimes sheer volume is a wonderful thing! On the downside, there were numerous "usual suspect" cards that already resided in my collection but from what I gather it's really to be expected with these wholesale opportunities. As I am sure many of you will agree, these releases from Upper Deck usually live up to their name and make excellent additions to any collection, regardless of your penchant for modern, junk, vintage or anything in between. This particular Donnie displays a beautiful "oil on canvas" style image of Mattingly executing his familiar swing plane from the left side of the plate. It's easy to appreciate and the dark, delicately raised and foiled border of this card works quite well with the contrast of the Yankees' pinstriped home uniforms. Throw in a little eye black and peekaboo stirrup, and we're GOOD TO GO. Please accept my apology for the blurriness of this image, but you get the idea. A cropped version of the card's front image sits atop some basic biographical data but the real gem is the popular "Mattingly statistic of choice", his streak of home runs in eight straight games during the 1987 season. At some point, I really should gather all of the cards I have that pay homage to this feat, just to get a sense of the quantity and diverse approaches. Still got it, Donnie! This is a great addition to my Mattingly collection. I hope you enjoy it, too. A recent post by my friend William over at foulbunt.blogspot.com motivated me to finally make a pilgrimage to the hobby and collecting treasure that is the "Columbia Antique Mall" (also known as "Chic Antiques") in Columbia, South Carolina. 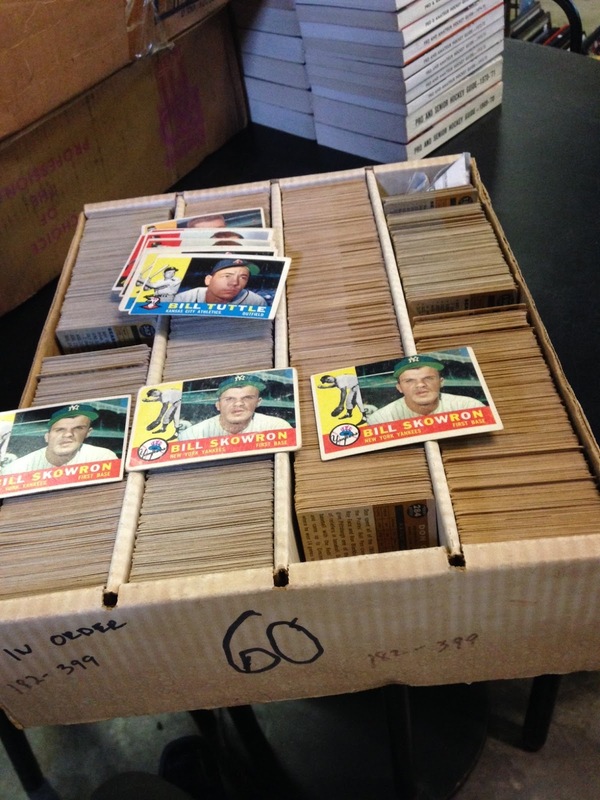 While the entire business covers a wide-range of treasures that fill two cavernous warehouses, my favorite part is the incredible sports cards & memorabilia collection that belongs to one of the proprietors, Conrad. Conrad has been collecting sports cards and memorabilia his entire life and has built an amazing catalog of inventory that focuses mostly on vintage baseball cards. His display cases are filled with stacks of vintage HOF cards. Each card resides within its own top-loader (and is typically penny-sleeved within, as well) and is adorned with a small post-it note that provides a "book value" and his price. Yes, the "BV" is typically the "Hi Value" from Beckett and the cards rarely approach the necessary conditions to demand the high price, but this provides a good starting point for collectors like me to perform a quick condition assessment and see if we're in the ballpark for comparison with his price. It's a very convenient way to start the conversation or at least decide if you'd like for Conrad (or another employee) to take out a card for a closer look. It's important to note that Conrad is always willing to listen to reasonable offers below his listed price. This is crucial in mind and it can really add to your comfort level when you're assessing higher value cards. Condition, price and "worth" are all very subjective (as we all know), so this approach is very conducive to encouraging happy outcomes for both stakeholders. Anyways, as luck would have it, I missed Conrad when I went to visit last week. He was enjoying some time on the golf course while I was enjoying some time around his vintage cardboard. While I was sad that I missed him, I think we were both pretty happy (and I was jealous of his time on the links!) with our situation. Determined to make the best use of my rare visit, I asked the very nice lady who was working (she is actually the shop's art consultant) if I could see Conrad's boxes of 1960 Topps cards. Yes, the shop has several glass display cases that are jam-packed with beautiful individual cards - but the true value of this cardboard heaven is the "back room" where Conrad has amassed dozens upon dozens of 5,000 count boxes that are both completely organized (by year, brand and in numeric order!) and completely filled with cards from the Tobacco era on up...it's amazing! Do you need some '67 Topps cards? No problem - BOOM - here's a few thousand cards to look through and find what you need. It's really something. Again, the cards aren't in mint condition, but that's not the point. It's a BOUNTY of vintage cardboard that is well organized and reasonably priced for you to select yourself and TAKE HOME that day without the cost of shipping and knowing FULL WELL what you just paid for. 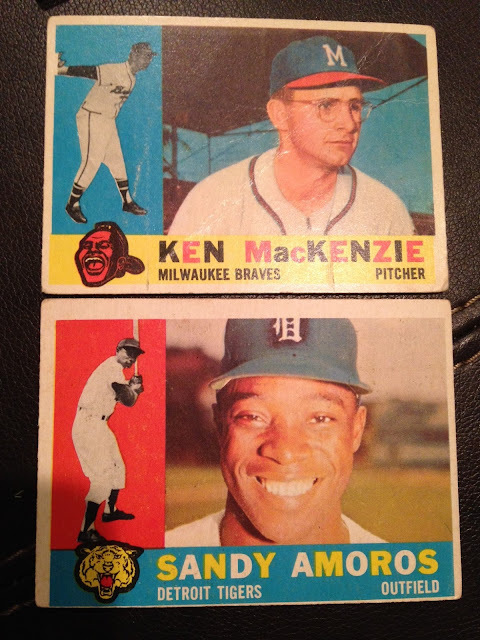 With the LCS apocalypse in our rear view mirror and card shows being few and far between in my area, Conrad's shop is a godsend - particularly when I'm on a mission to complete my Dad's 1960 Topps set. I hadn't crossed off any cards from that list in some time - and time is precious. Let me know if you need a Bob Hartman, too! Since Conrad was hitting the links that day, he had to think quickly on his feet when the art consultant called him for pricing. She hung up the phone and quoted me $2 per card. In retrospect, I really should have taken it. I enjoyed seeing the variations in "marking" techniques on three of these four checklists! I am proud to carry on this set-build quest today, 55 years later! Check out the All-Star portion of the list at the bottom of the card - no Eddie Mathews, Ernie Banks, Mickey Mantle, Roger Maris or Hank Aaron (sad trombone sound) for the kid I imagine to have been tracking his progress decades ago...while our hero DID manage to obtain the two Willie's and the Al Kaline, I can still picture him mumbling as he ripped packs that fall (late summer?) and wondering if he would EVER pull what he needed. Good stuff. Speaking of good stuff, let's see what else I managed to find. 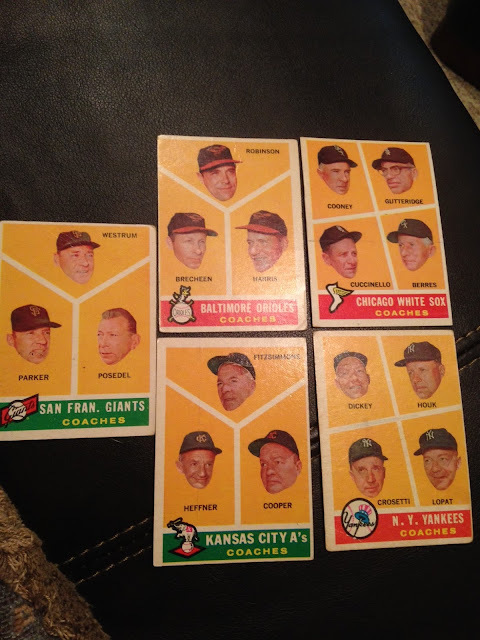 Here are those Coaches cards I was talking about earlier. 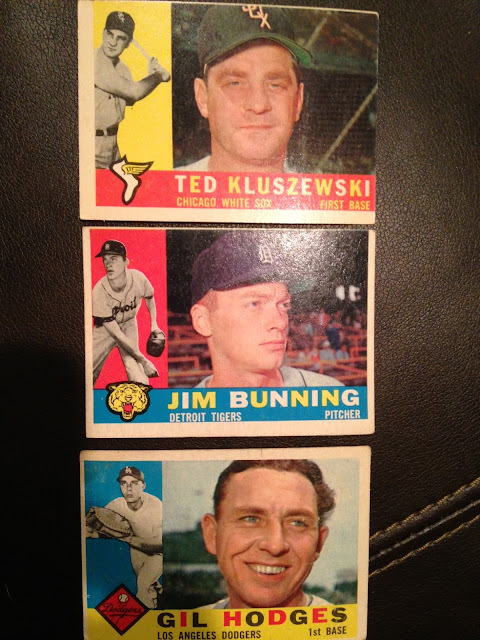 Hard to find, these gems deliver a a unique opportunity to snag some vintage of legendary players at a severe discount to cards from their playing days. Are you a fan of Yankee greats like Bill Dickey (HOF), Ralph Houk, Ed Lopat or Frank Crosetti? Get 'em all on one card! Floating heads - never a bad idea. SP's - not JUST your modern card gimmick! Yes! These two come from the seventh and final "high number", short-printed (SP!) series released by Topps for the 1960 set. 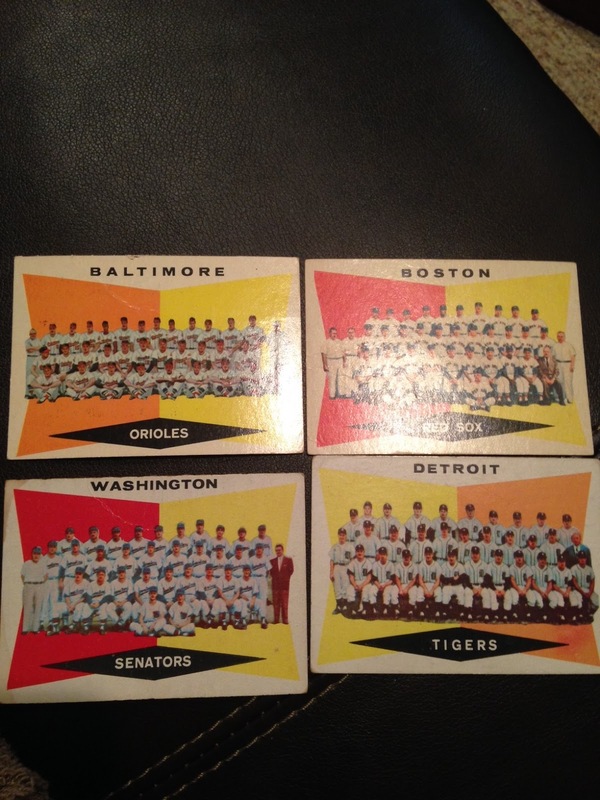 The entire series consisted of 66 cards, #507 through #572. This Amoros and K-Mac represent numbers 531 and 534, respectively. 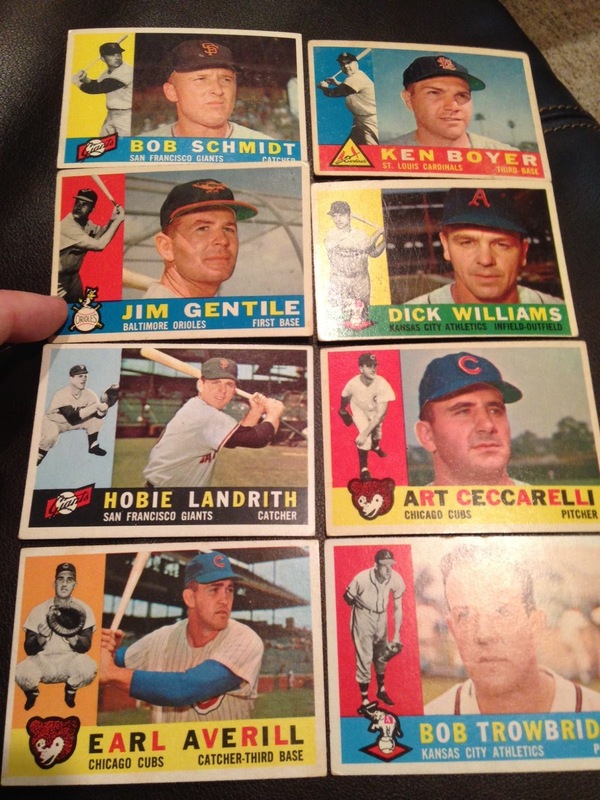 of the 59 cards remaining on my NEED list, nearly half of them (28) come from this 7th Series. Therefore, the severe cross-diagonal crease on K-MAC and Sandy's <80-20 centering didn't even matter when I decided to buy or not...but again, it did factor into my offer. While Senator Bunning is the only official Hall of Fame inductee in this trio, the other two can be seriously viewed on a level playing field. Gil Hodges has continued to flirt with induction for decades and Big Klu has certainly earned his spot in the lore of the White Stockings. Ted led the league in long balls one season and was a multiple All-Star selection and World Champion. Gil slugged four home runs in one game a decade before this awkward mugshot was released (1950) and also boasts a hat trick of gold gloves to go with his All-Star selections and World Series rings. Both players have their numbers retired by their clubs. Good stuff! Bad centering...but fantastic baseball cards. Hey, there's the WINNING Hartman out of the multitude of options pictured above! The Pascual All-Star card is a great pick-up but has some surface loss in the lower right. This was probably the toughest card I had to accept that day, but in light of the circumstances, there was no way I could leave it behind when I am so close to the finish line. The Moose card was a nice surprise in the box, too. Skowron is considered by most to be a pretty memorable star, even among the crowded memories in Yankee Stadium. I can't believe that my old man (a Yankees fan) had never gotten around to trading for the entire Yankees team set, but there you go. The checklist doesn't lie...and cool is it that I can now wrap it up for him? Gives me chills. Has anybody ever referred to '60 as the Skittles set? If not, I'm coining it! A few of these are pretty stunning cards. I was able to, once again, fish around through dozens of duplicates and compare until my OCD-collector's heart was content. What great way to spend a lunch break, right?! Though deemed to be "commons" by the harsh reference documents of our Hobby, the colors are vibrant and the creases are minimal...heck, there are even a couple of sharp corners in this batch. And so there you go! I set these 26 cards aside and asked the art consultant for pen and paper so that I might leave a thank you, offer, and explanation for Conrad to consider. I also added an EPIC Hall of Famer vintage rookie card to the stack but I'll cover that gem later. I received a call the following afternoon and Conrad was very gracious as he chuckled. "You should have taken the $2/card price and run away!" I smiled and asked him what he was thinking...he went on to go through each of my 26 cards and explain their relevance within the set. 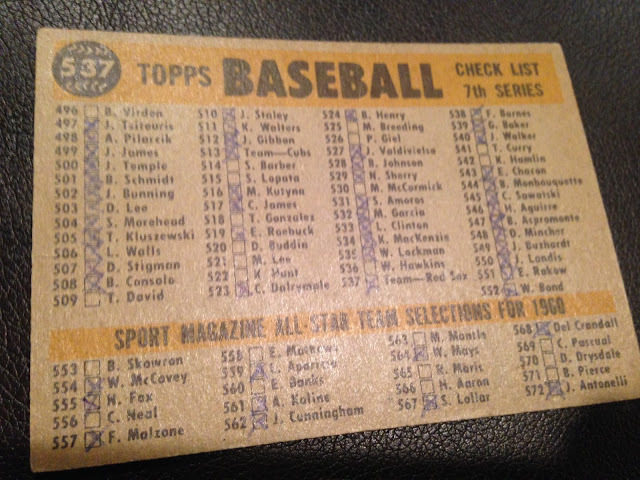 The rarity of inserts and the hard-to-find nature of the checklists, coaches cards and SPs. His math began by adding up the maximum (remember, Beckett "HI") value for each card as a point of reference - this reached over $200, my friends, so my $30 offer obviously looked a little wimpy in contrast. Of course, the cards I was buying wouldn't come close to that value - and he recognized that. We began to discuss a middle ground. I reminded him that several of the rare/high dollar checklists were actually marked on, effectively rendering them down to the basement levels. He kindly agreed and continued to work with me on the price, though he did remind me that it was important to consider rarity. I nodded my head in agreement and reassured him over the phone, "I definitely understand what you're saying, Conrad." I could go on, but I'll spare you the agony. In the end, we agreed upon a price of about $75 for the lot - just a little bit under $3 per card. On one hand, it was a little painful to see my original offer tripled...but my conversation with Conrad and the undeniable value associated with being able to cross these cards, some of them quite tough to find, off the list of this very special collecting mission made it easy to acquiesce in the end. During my search, I had a very pleasant conversation with art consultant regarding Conrad's collection and the man himself. She revealed that Conrad loved a good cup of coffee - black, nothing special. So, after we agreed on the price, I assured Conrad that I would stop by as soon as possible complete the purchase and that I would have a steaming cup of coffee for him. He gave another warm chuckle and we exchanged our goodbyes. In the end, I feel like a still got a great deal. I feel like I gained some perspective during this process and learned a little bit more about this part of the hobby that I love so much. Vintage, set-building and some great conversation. What could be better? Hopefully, Conrad will still greet me as a friend and fellow collector the next time I bring him a cup of coffee. I think he will. What do you guys think? Was it a fair deal for both sides in the end? Do you have any similar tales of vintage hunting and lot-purchasing of old "raw" cards? Let me know what you think and feel free to check out my "Set NEEDS" tab to see if we can help each other! 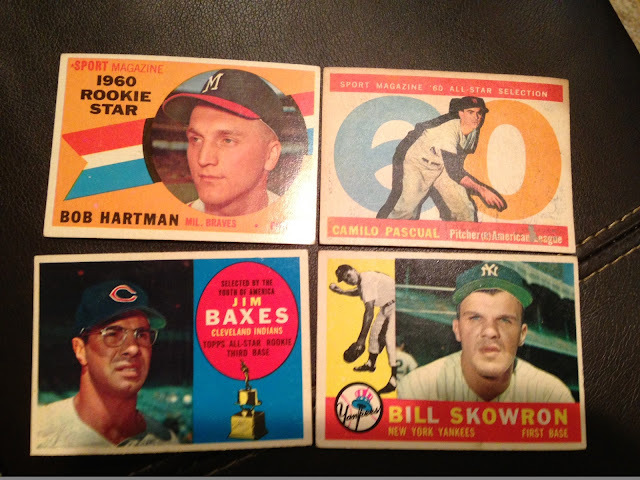 Over the past few weeks, I've enjoyed a robust hobby conversation with Chris Geiss, co-founder of Graded Greats. After "meeting" via twitter (as @ryanspitch and @GradedGreats) when I decided to give their Graded Greats Series 2 product a try, we quickly discovered a shared passion for card collecting. 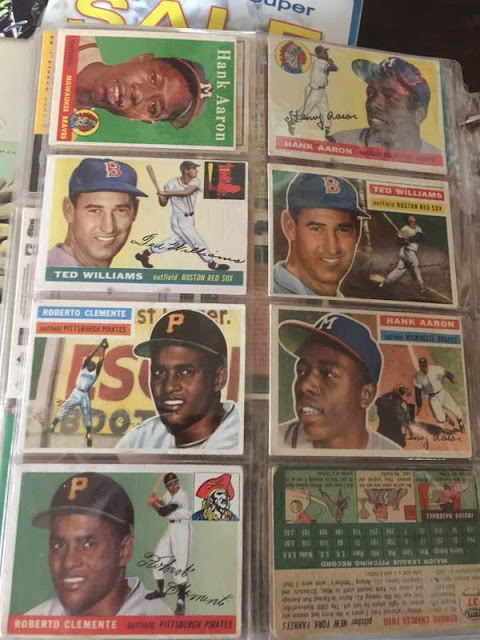 In particular, Chris and I have an affinity for vintage cardboard and have apparently been on parallel journeys into the world of graded cards, vintage or otherwise. As readers of this blog know, I often strike a schizophrenic balance between both ends of the cardboard appreciation spectrum. One end offers what many consider to be the most organic hobby experience - collecting without the burden of concern for cards' 'value', 'condition' or even thematic organization. The opposite side involves concepts such as investment, market reports, registries and grading authorities - a hobby vernacular that has only come into mainstream focus during the past ten years. Please note, I firmly believe that enjoyment of the hobby exists at both ends and at every point in between. While my dabbling in all of the above has created a more complex collecting approach that I am continuously refining for my own collecting pursuits, I've learned a lot and met some wonderful people along the way. And my education certainly continues. Graded Greats caught my attention because their product presented the possibility for me to bridge the gap between both ends of my hobby spectrum. Could they truly capture the fundamental excitement of opening a pack of baseball cards and combine it with the value-driven but predictable peace of mind that comes with purchasing graded vintage cards? RyansPitch: What was your first introduction to the sports card hobby? Any fond memories of your first card or set? Chris Geiss: My first introduction to cards occurred when I was about 5 years old. For some reason, I recall the '77 Topps football set but I more clearly remember the '81 Topps baseball set and busting those rack packs! I went on to collect through high school and opened a shop while in college for about 4 years. I also participated in a lot of shows during that time. RP: Would you describe yourself as a baseball fan who collects cards or a collector who enjoys baseball? As a collector, how has your collecting approach evolved over the years and what are you currently collecting? CG: I guess I would describe both myself and my co-founder, Cody, as collectors who are also fans of the game. We both played on the same legion baseball team and spent plenty of time talking about baseball and every other sports as well. From a collecting perspective, Cody and I are both fans of the "old" stuff. Even during the 80's, we were always intrigued by the classics. RP: We seem to share an affinity for vintage cardboard - can you describe your affection and/or attraction to the classic, vintage elements of our hobby's offerings? CG: I enjoy vintage because it never changes and I believe it will always be sought after. There aren't going to be anymore Mickey Mantle 1960 Topps cards produced but Mike Trout will continue to sign autographs and have more of his own cards created for years to come. RP: How were you introduced to graded cards and what was your first 'slab' purchase? CG: I was introduced to grading several years ago and was instantly impressed. They looked so nice in the slabs!! The first graded card that I added to my collection was not a purchase; rather, it was a '86-'87 Fleer Michael Jordan that I sent in myself for grading...and it came back as a "7"! RP: What's your favorite graded great in your own collection? CG: My personal favorite is a PSA 10 1993 Topps Derek Jeter rookie card because I can still remember pulling it from a pack 23 years ago but didn't submit it for grading until last year. RP: George Lucas came up with the concept of the Millennium Falcon while chowing down on a hamburger - please set the scene for us regarding the genesis of the Graded Greats box. During a subsequent meeting, we decided to add some vintage packs to the graded cards and this has proven to be a very exciting element for our customers. 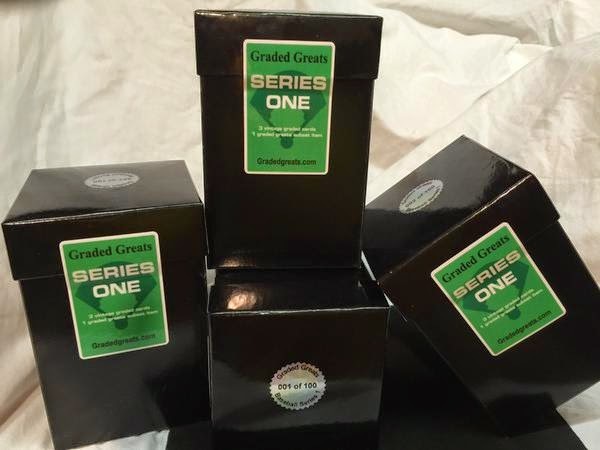 Graded Greats' original Twitter "teaser"
RP: For anyone who might be unfamiliar with your product, what does each Graded Greats box contain? CG: Series 1 and Series 2 boxes contained 3 graded Hall of Fame cards and one additional 'vintage' item (pack, raw card, relic, autograph). Each box was individually stocked with carefully packed pouches and sealed with its own unique serial number in that particular batch. It's our goal to ensure that the end result delivers a great balance of "ripping" or unveiling excitement with an appropriate level of return on value - regardless of the unknown potential in items such as unopened packs, etc. 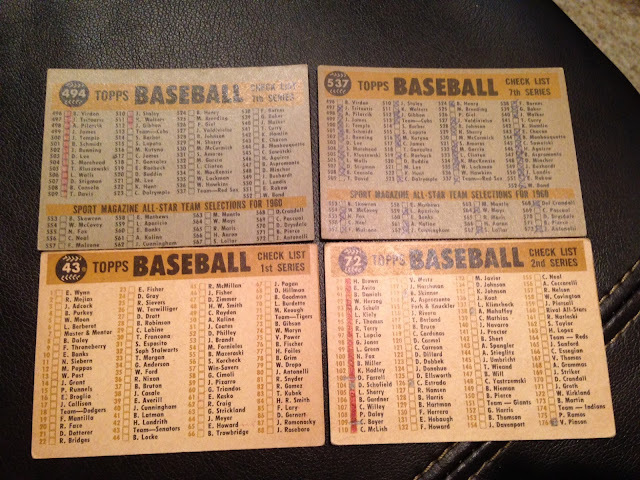 RP: According to your site, only cards from the "top 2 grading authorities" are included in your product. Which firms did you select, how did you determine these two finalists and what do you like/dislike about each company's product (slab design/quality records/etc.)? Any suggestions for these companies? CG: We chose PSA and Beckett because of name recognition and the trust that we perceive them to have built with the hobby and its collectors. RP: Opinions might differ, but from your point of view, what's been the greatest graded card you've dropped into a pouch and mailed off to a customer? Greatest pack? CG: The greatest graded cards will truly be dropping into Series 3 boxes, and could easily be chosen from any of the ten raw, vintage HOF cards that we've submitted to PSA for grading. Personally, I would go with the 1966 Mantle! As for greatest pack, that would certainly vary by personal preference as you suggest. 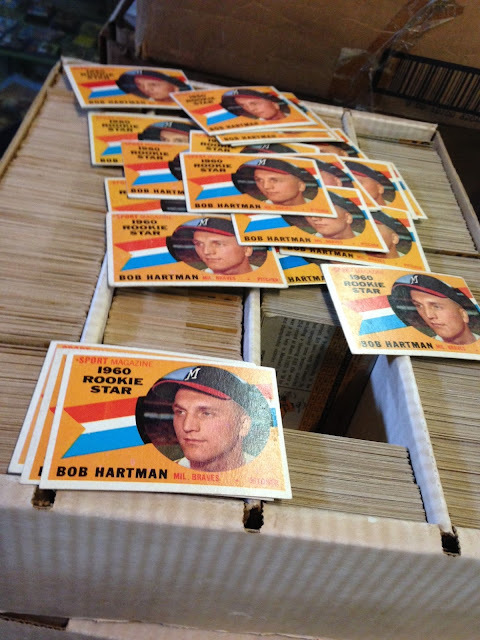 We've sent out a lot of '78, '79 and '80 Topps packs - all of which carry a high "unopened vintage-wax" value. RP: As some collectors build their own graded card collections, what are some of the best methods that you've encountered for storage, transport and display of these collectibles? CG: We have seen a lot of methods for storage during our 'hunting' trips. I've seen some collectors customize walls in their collecting spaces by notching out perfect spaces for PSA slabs. If you want to display them without modifying the family homestead - there are a lot of other modular, mobile and cost-effective options! If you're acquiring graded cards for investment purposes, a small fire-proof safe is a simple way to keep them safe, come what may. Slabbing & Vintage Hunting - Precious Cargo! RP: What can customers expect from Graded Greats in the future and specifically, Series 3? Ryan's Pitch is always happy to facilitate the announcement of exciting news! Essentially, we're trying to capture the excitement of online group breaks with a vintage twist. Participants' entry fee will guarantee them a pack from a sealed wax box from a vintage release. Each pack will be paired with a raw vintage card of HOF player that the participant will receive in addition to what they pull from their pack. On top of that, we will make things interesting by attaching other "chase cards" to random common cards in that particular set. Theoretically, we might determine beforehand that card #361 from the '76 Topps set ( the Tigers checklist card, by the way) will be "exchanged" for a premium card (graded HOF, star player auto, etc.). Therefore, a participant could actually walk away from a '76 break with an exchanged premium card, a Winfield RC and their pack's paired raw HOF card. An entirely new spin on group breaks! 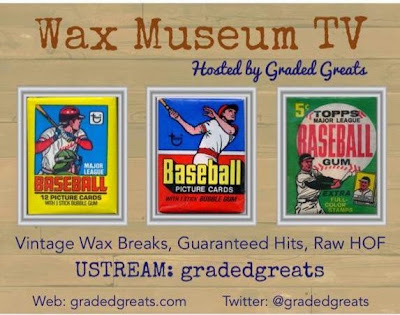 Be sure to follow us on twitter (@gradedgreats) and on Ustream (gradedgreats) for updates and information. Feel free to reach out if you have any questions or are simply interested in joining the hobby conversation - we're looking forward to having a lot of fun! RP: Sounds amazing, Chris. I appreciate you taking the time for our conversation and applaud your company's efforts to think outside of the box. Our hobby can become somewhat stagnant at times so it's refreshing to see something new and have an option that incorporates different collecting approaches. Best of luck with Graded Greats! CG: Thanks, Ryan! We're always up for discussing our latest ideas, products and our passion for hobby in general. At the end of the day, we're collectors who are lucky to be doing what we love and are very excited to share that love with fellow collectors. Thanks to Graded Greats and Chris Geiss for a great discussion. I hope you guys enjoyed it, too! What are your thoughts on their products, ideas and overall strategy/approach? How do you feel about graded cards, vintage packs or group breaks in general? Please feel free to leave your thoughts below or reach out to me via twitter (@ryanspitch ) or email (ryansdugout@gmail.com). Been awhile - miss you guys. It's been an incredible year for my family so far. We welcomed our third child into the world back in March - hence, my disappearing act. Don't worry, my cardboard and hobby addictions are still going strong. As proof, behold what might be the oddest "push present" of all time - Dan Uggla? For my oldest child and (what is agreed upon to be!) my only princess, I dropped a nice (Hallmark) card and some artist jewelry in the glove compartment of my car for my wife to enjoy as we made our way to the hospital back in 2007. She loved the jewelry and didn't kill me during the nearly 40 hours of labor that followed. I consider that a success! Not to mention...we ended up having more than one kid. In 2011, I stepped up my game and added a bit more sparkle to the ride that would ultimately deliver our first boy. You know, the one that scratched that hobby itch after being dormant for twenty years? I talked about my son's arrival back in 2012 here. The sparkles were a bit more expensive that time, but we had been very fortunate and, heck, she earned every last sparkle (and then some) for making us a family of four! So, what to do for the tie-breaker? #3 was late enough in the month that a birth-stone piece was too risky for my tolerance levels. Not to mention, a birth photographer was on-call and this service was proclaimed to be the push present so "don't get me anything else, babe." So, naturally, I began to consider baseball cards. Makes sense, right? Well, while my wife supports my hobby endeavors, she certainly doesn't collect herself. She does like baseball however and, as an Atlanta native, she shares in my affinity for the Bravos. She even [had] her favorite player - Dan Uggla. It became a joke between us over the past few years as Uggs contributed proficiently towards the repeated "close-but-no-cigar" seasons for our beloved Braves. I cursed his performance while she praised his cuteness. Don't get me wrong - Mrs. Ryans Pitch understands the game and knows that her Dan wasn't the best 2B in the league...or even on the team...but we all have our favorites, and having a wife who is into baseball at any level is a definite blessing. Just like the blessing that was headed our way a couple months ago (WOW, has time flown!) - so why not combine the two!? 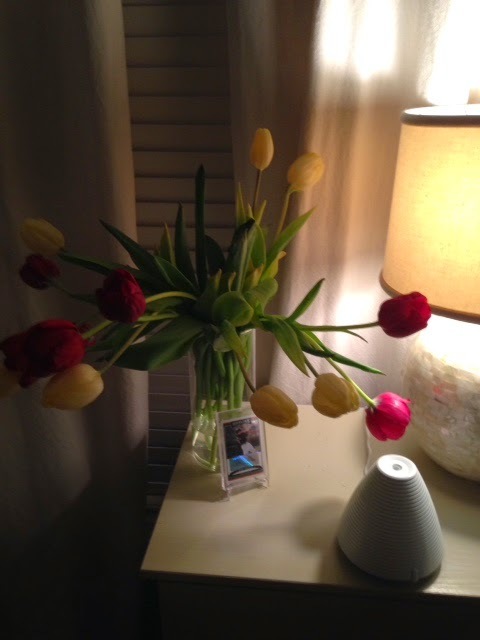 So, I did it - for a couple of bucks, I snagged a crisp little Uggla RC auto and dropped it into a snazzy one-touch beside a vase of tulips...right on her bedside table. I set it all up a week or so before the due date to allow for proper appreciation with the long-term goal of it becoming her focus during early stages of labor...hey, all yours, Dan. She had no idea...so it was a complete surprise. She loved it and shared her little Dan with her world via Facebook within minutes. "Look what my thoughtful husband surprised me with..."
Pretty cool. I had no idea how it would be received and could never have imagined that I'd throw inhibition to the wind and buy my wife an autographed baseball card - to show my love for her during the arrival of our child, no less!? But then again, it does kind of make perfect sense to me. Long live this glorious hobby.